Web applications accounted for an astounding 40% of last year’s security breaches. The challenges of securing legacy systems, third-party apps, and the extensive shadow IT landscape can be challenging, to put it mildly. 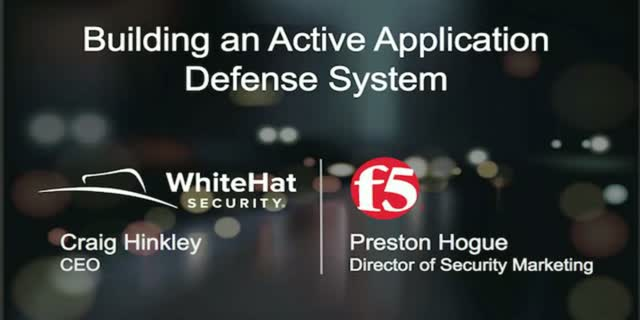 But here’s the good news: The combined F5 and WhiteHat Security approach to web application security represents a powerful new way for organizations to defend against application-level attacks. Companies are constantly developing new applications, and it’s expensive to stop and patch as soon as a new vulnerability is found. Additionally, it may not be practical to remediate every finding due to issues with legacy code, third-party integrations, or other inherited limitations. But the integration of F5 Networks and WhiteHat Security technology helps you more quickly identify and remediate vulnerabilities in your web applications. By automating updates to the web application firewall, you can ease the burden of management and reduce costs, while ensuring that your security posture remains strong. To help educate the market on avoiding breaches of this nature, the experts at the WhiteHat Security Threat Research Center (TRC) have compiled a Top 10 Application Security Vulnerabilities for Developers, detailing the most common web exploits used by malicious attackers during the past 12 months. Join Mark Rogan from the WhiteHat Security Threat Research Center and Calvin Nguyen, Director of Product Management, as they discuss the top vulnerabilities and give valuable prevention tips for enterprises to implement. The Internet of Things (IoT) is a strategic direction for 56% of the enterprises in the next two to three years*. For most people, the term IoT conjures up a wealth of opportunities and a vision of a hyper-connected world, but with great innovation comes a greater risk. - How do you keep ahead of the cyber threats surrounding these connected devices? - What are some of the biggest security challenges and how to address them? - How do you ensure the security of the sensitive data generated by your IoT devices? Join us in this webinar to learn about how you can combine IoT innovation with security strategies to protect the core and surrounding systems of IoT devices, including the web and mobile applications, servers, databases, and their integrations with other systems. As the Vice President of Product Management, Setu is responsible for product vision, strategy, and direction at WhiteHat Security. Setu joins the WhiteHat leadership team after a 10+ year stint at TIBCO Software Inc., where he most recently led product management and strategy for the Operational Intelligence product portfolio. Financial services industry has always had to deal with security risks and expensive data breaches because of regulatory fines and higher than average rate of lost business and customers. But with today’s continuously evolving cyber threat landscape, keeping up with regulatory compliance alone is not enough. Per the 2016 Verizon Data Breach Investigations Report, web application attacks are the Achilles heel for security, responsible for 82% of data breaches in the financial services sector. Join this session to learn more about cybercrime trends in financial services, and how a continuous application security assessment program can help financial service organizations improve their security posture and mitigate risk. Ryan O’Leary is Vice President of the Threat Research Center and Technical Support at WhiteHat Security, the specialized team of web application security experts. Ryan joined WhiteHat Security as an ethical hacker in 2007 and has since developed a breadth of experience finding and exploiting web application vulnerabilities and configuring automated tools for testing. Ryan swiftly rose through the ranks to become the Vice President of WhiteHat Security’s Threat Research Center in 2016. Reporting directly to CEO Craig Hinkley, Ryan now manages a team of over 150 security engineers. Under Ryan’s leadership, the team has built a one-of-a-kind database that combines details of more than 26 million vulnerability patterns with proprietary algorithms to assess the threat level. Mobile devices are everywhere throughout the workplace, and outside the workplace, but mobile phone security as a discipline has been focused on parts of the solution such as WiFi connections, anti-virus and spyware. Mobile security apps are everywhere - but what are they securing? What is the actual security impact to your organization of insecure mobile app usage? For meaningful risk management, you need to understand both the qualitative and quantitative values of mobile security risk. Join WhiteHat Security and our technology partner NowSecure for a discussion on leaky apps, and how they can expose private and sensitive data - but more, what kind of data can be exposed. We’ll review how insecure mobile applications can create incidents, and how they impact the enterprise or organization. Finally, we will introduce you to the different ways WhiteHat can help you build mobile security into your larger DevSecOps and vulnerability management programs. Setu Kulkarni is the VP of Product Management at WhiteHat Security. Setu is responsible for product vision, strategy, and direction at WhiteHat Security. Setu joins the WhiteHat leadership team after a 10+ year stint at TIBCO Software Inc., where he most recently led product management and strategy for the Operational Intelligence product portfolio. With cyber attacks on the rise, how can we apply our knowledge about attackers into better protecting our organizations? There are some key personas when it comes to who is attacking web sites. Everyone from teenagers to national agencies are hacking organizations via their websites now – 40% of the time. Each attacker has their own motivation and unique skills that they use to pull off quite different attacks. The type of persona most likely to attack your organization gives insight into the methods and suggested remedies. Ryan O’Leary is VP of the Threat Research Center and Technical Support at WhiteHat Security, the specialized team of web application security experts. Ryan joined WhiteHat Security as an ethical hacker in 2007. Reporting directly to CEO Craig Hinkley, Ryan now manages a team of over 150 security engineers, based in three locations over two continents. He is also responsible for overseeing the delivery of WhiteHat Sentinel, which services over 10,000 customer websites. Under Ryan’s leadership, the team has built a one-of-a-kind database that combines details of more than 26 million vulnerability patterns with proprietary algorithms to assess the threat level. Seamlessly integrating AppSec testing into CI processes earlier in the SDLC has become the holy grail of DevOps and security teams. Achieving this means apps are not only more secure and can be deployed more quickly, but companies are also able to reap substantial cost and resource savings. Join Mike Goldgof, WhiteHat Security’s VP of Marketing, to learn about best practices and what’s needed to fit security testing into highly-automated Agile DevOps processes, that are transforming the development world and speed of delivery dictated by businesses today. Getting app development, DevOps and security teams all on the same page when it comes to implementing AppSec testing in development workflows is often a difficult task. Developers need to do frequent code releases to meet continuous integration (CI) process requirements. Adding security testing into this process is often met with resistance and poor adoption, unless it’s done correctly with the right security training, developer and CI tools integrations, and corporate security buy in by all involved. Join us as 451’s Scott Crawford and WhiteHat Security’s Anna Chiang discuss what’s needed to truly integrate security into a DevOps environment.